Pension – Revision of pension with effect from 1—1—2006 – Provisional Pension – clarification – Issued. Grade posts with reference to para – 2 (vi) of G.O. Ms. No. 235, Finance(Pay Cell) Department, dated:1—6—2009 – Instructions . Pension – Qualifying service for pension and calculation of pension – Date of effect – Revised Orders – Issued. Pensioners’ Family Security Fund Scheme – Enhancement of financial assistance from Rs.25,000/- to Rs.35,000/- in the case of death of pensioners. G.O. No. 184, Finance(Pension) Department dated: 1-6-2012. Family Pension to physically handicapped children with 100% disability – producing Medical Certificate every three years – procedure dispensed with . 39 ~~ do ~~ G.O.170 P&AR(S) Department dated:18.12.2009. Qualifying service for pension –service before resignation– in Government/ Aided Educational Institutions. 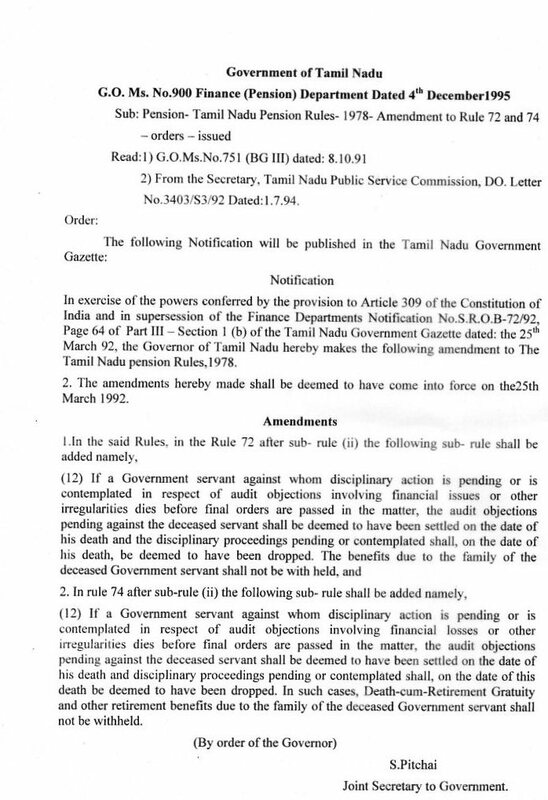 46 Revised Pension- Fifth Tamil Nadu Pay Commission- Modifications G.O.Ms.No.713 Finance (Pay Commission) Dept. Dated: 28-6-1990. 47 Pension- Treatment of DA as Dearness Pay for the purpose of pension revision G.O.Ms.No.272 Finance (Pension) Dept. Dated: 15-6-98. 48 Pension- Treatment of DA as Dearness Pay for the purpose of pension revision G.O.Ms.No.273 Finance (Pension) Dept. Dated: 15-6-98.